An MRI exam Tuesday morning on Cousins' left leg revealed the tear. 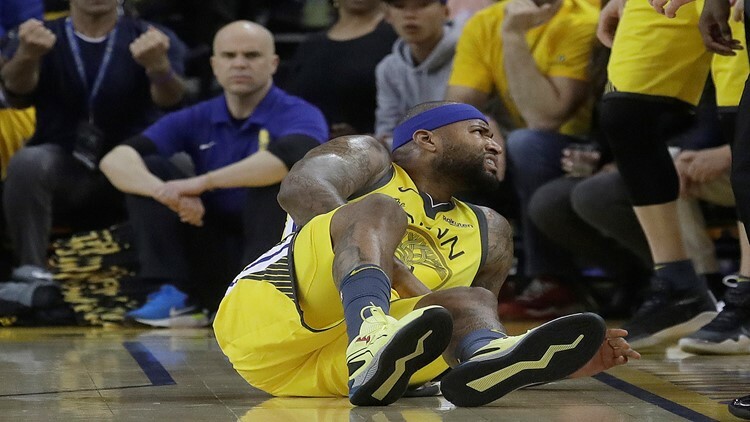 OAKLAND, Calif. (AP) - DeMarcus Cousins has a torn left quadriceps muscle that will sideline the Golden State center indefinitely, a devastating injury that the Warriors feared was serious when he went down in the first quarter of their first-round playoff loss to the Clippers. An MRI exam Tuesday morning on Cousins' left leg revealed the tear. The Warriors say Cousins will begin immediately on his rehabilitation and updates will be "provided as appropriate." Coach Steve Kerr said after the Warriors' 135-131 Game 2 loss on Monday night that Cousins would be out for a significant period of time. Playing in just his second career postseason game after a nine-year wait, Cousins hobbled to the locker room at the 8:09 mark of the first quarter.